Cadillac Car cRash IndianaWell, I never realised how lucky my friends were until I saw the wreck myself. Here's the story. Matt and Jay, 2 good friends of mine, were drinking and poping Zanex, So neither of them should have been anywhere near a car. But they was out of beer, so off to town they went. Matt was driving, according to him he wanted to see how fast the car could go, So he had it floored the whole way. They were driving down Miami Garden Road. he wanted to see how fast the car could go, So he had it floored the whole way. Well, I never realised how lucky my friends were until I saw the wreck myself. Here's the story. Matt and Jay, 2 good friends of mine, were drinking and poping Zanex, So neither of them should have been anywhere near a car. But they was out of beer, so off to town they went. Matt was driving, according to him he wanted to see how fast the car could go, So he had it floored the whole way. They were driving down Miami Garden Road. Just up ahead was an intersection with a flatbed semi stoped. Matt didn't see it in time to stop, He doesn't remember ever hitting the brakes or even taking his foot off the gas. He cut the wheel sharp but it was too late, they slamed hard into the back of it. According to the police report they moved the semi 5 feet! That pretty much brought them to a dead stop. 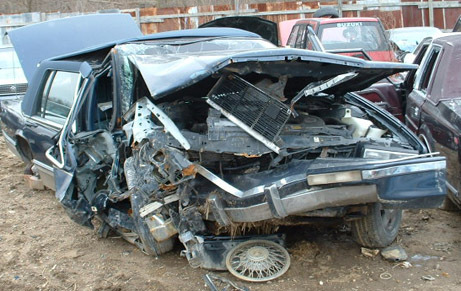 Matt was saved by the airbag, And Jay was saved by his seatbelt, but it ended up snaping him back, breaking the seatback and throwing him in the backseat. Truely amazing that they lived. But even more amazing, Neither of them was hurt real bad, a couple scratches and they were sore the next day, but they were both ok enough to pick a fight with the truck driver who got out to check on them! Well, they both got tossed in jail, but did learn a lesson from this, neither of them drink and drive and they've totaly sworn off popping pills. It always amazes me, the drunks never seem to get hurt in a wreck, but at least this time, no innocent people were hurt or killed. 1. Please use either a jpg or gif format. Tell us your story please include a description, date of the accident and the accident location.